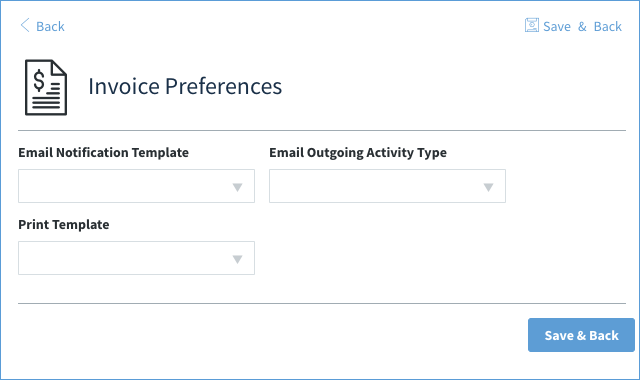 The Invoice Preferences screen can be accessed from your dashboard by clicking on the ellipsis (⋮) on your Invoices App and selecting Preferences. When an invoice is created, you are given the option to print or email it to the customer or lead it's been assigned to. Email Notification Template - Email Template used when clicking the Email button on the invoice, which sends an email to the customer. To edit this template, go to Method's Send Email App, and select Edit Templates. Email Outgoing Activity Type - When an email is sent to the customer via the Email button, an activity is created. The activity type is set to this dropdown. Print Template - When the Print button is clicked on the invoice, a PDF file will be created and will use the template chosen here. To edit this template, you need to use Method's Report Designer tool. Note, when these dropdowns are blank, then the defaults are used.